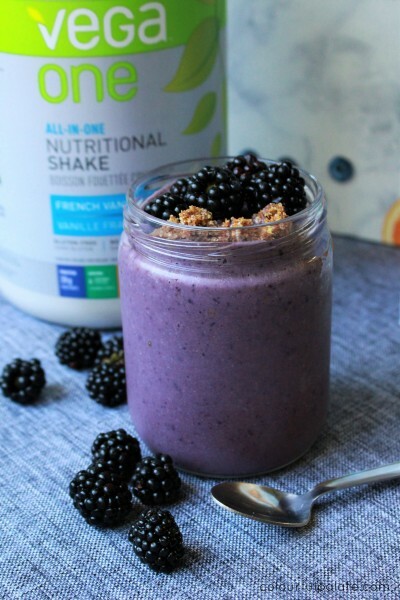 Blackberry Crumble Smoothie was posted on October 12th, 2016 and is filed under Breakfast, Desserts, Gluten Free, Low Carb, Protein, Recipes. This entry has 3 comments. You can follow any responses through the RSS 2.0 Comment Feed. …but for today, I’d like to share my newest smoothie. 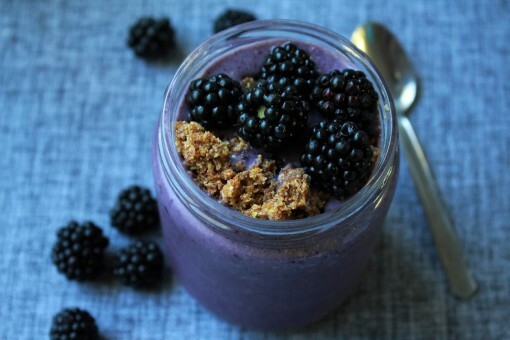 I love transforming sugar-filled desserts into healthy smoothies, so when I found myself with an abundance of blackberries in my fridge I decided to do a healthy take on a blackberry crumble dessert. Vega sent me a kit of smoothie love with Silk almond milk and protein powder to celebrate the “back to school” (or for me, going to work) season. I love how easy it is to quickly throw things in the blender and take a smoothie on your commute. I’m trying to make this my “ride to work” habit. It doesn’t have to be complicated. Simple is the name of the game with Vega smoothies. Get your blender ready! Serves 2. 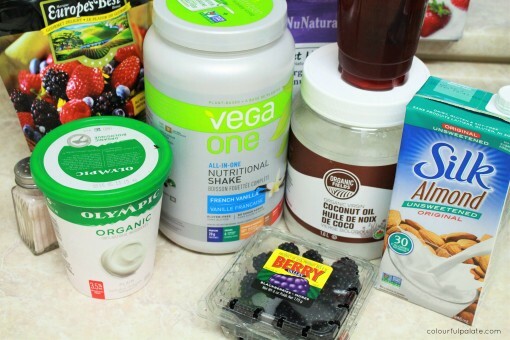 Blend all your smoothie ingredients together. Pour into two glasses. Mix the smoothie topping together with a spoon. Make sure to grind the flaxseed fresh (I used a small coffee grinder – it works great!) as often pre-ground flaxseed will be rancid and taste a little bit “off”. 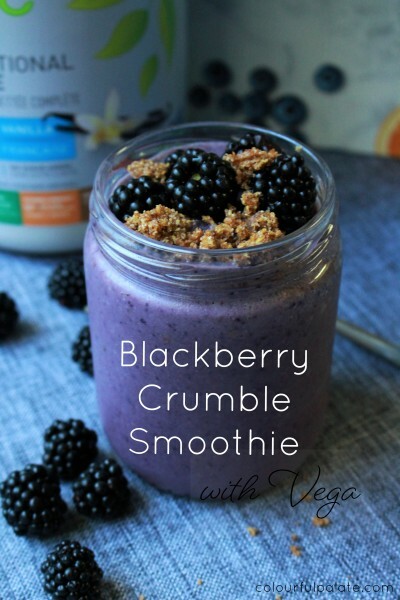 Sprinkle the top of the smoothies with the “crumble” topping and fresh blackberries. Serve! This is a great after-dinner dessert as well! What is your favourite berry? What is your go-to dessert (I’m in the mood to make more dessert inspired smoothies – so inspire me!)? Disclaimer: This post was not a paid promotion, but product only. Vega has been one of my favourite brands for years and I’m always happy to promote their amazing products. Looks lovely! I’ll try it. This looks absolutely scrumptious! You’re a genius!